It’s good to bite a carrot. It’s good to bite a steak. It’s bad to bite your sister! She’s not a piece of cake. That’s what this book’s about. you’d better check it out! 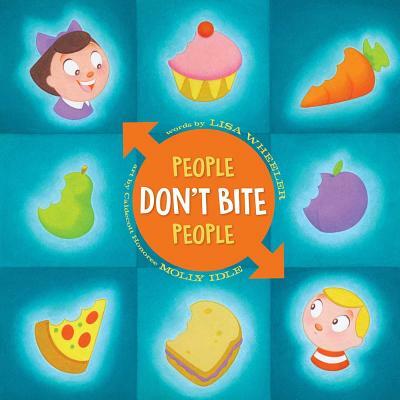 Molly Idle is the Caldecott Honor–winning creator of Flora and the Flamingo, Tea Rex, and Pearl, as well as the illustrator of Lisa Wheeler’s People Don’t Bite People and People Share with People. She lives in Tempe, Arizona, with her fabulous family, and when she’s not scribbling away on her next project, she can be found (figuratively) devouring one of her favorite books, or (literally) devouring one of her favorite snacks…like blueberry pie! Visit Molly online at IdleIllustration.com. "In People Don't Bite People...that Class-A preschool felony is faced head-on with the snappy verve of a 1950s tooth-paste jingle: "It's good to bite a carrot. It's good to bite a steak. It's bad to bite your sister! She's not a piece of cake." The drawings are bright and no-nonsense, quickly removing, like ripping off a Band-Aid, the stigma of biting. The message is outlined and repeated in tick-tack-toe squares with plenty of illustrations and humor, straight-forward, with a hint of Mary Poppins's intolerance for nonsense." * "In a combination of listicle, admonishment, and pep talk, the well-matched Wheeler (Babies Can Sleep Anywhere) and Idle (the Flora books) remind children that they are too long in the tooth, so to speak, to be chomping on others.... Wheeler’s four-line stanzas deploy repetition and rhythm for maximum percussive punch.... Idle’s pert, radiant pictures alternate between neatly divided worksheet-style grids (which correspond to the bitable and nonbitable items and people mentioned in the verse) and blithe vignettes.... The aesthetic is reminiscent of 1960s educational films, with every character exuding comic, pedagogical earnestness. Whether readers are biters, bite-ees, or witnesses to a biting incident, they’ll find this a toothsome treat." *"Paired with a neatly drawn cast of doll-like animals and human figures in Caldecott Honoree Idle’s spacious, harmoniously hued illustrations, Wheeler’s infectiously exclamatory rhymes present her anti-biting message with lighthearted but compelling persistence . . . A chewy theme for children with biting issues, and a rollicking readaloud for all." "Subversively lilting rhymed verse. . . The humorous text is all fun and games (the refrain: 'Biting is for food! '), but the underlying message about anger management is useful and age appropriate. Idle’s dynamic colored-pencil illustrations use many of her familiar poses from her Flora books . . . Simple rounded shapes in saturated hues, surrounded by dimension-giving, drop shadow outlines, keep the pictures clean, lighthearted, and easy to follow. A sweet conclusion that smartly anticipates preschooler logic provides an exception to the no-biting rule." "A rollicking reminder of what to do—and not do—with your pearly whites.The commandments rhyme and scan terrifically right out of the gate.... Refrains reiterate that "BITING IS FOR FOOD!" —once fabulously rhymed with "You're not a zombie, dude!"... Idle's pencil colors are rich and soft...get this [book] to summon instant rereads and loud participation." "This instructional book about biting goes above and beyond a basic lesson with its cheeky rhymes and bright, over-the-top illustrations. Wheeler writes in precise rhythmic rhyming verse.... Caldecott honoree Idle’s wide-eyed, retro children jump off the page.... Adults and children alike will appreciate the humor in both the text and illustrations.... This book is sure to elicit giggles from group read-alouds or one-on-one sharing. Add to any collection in need of a wildly entertaining title that addresses a common childhood issue."